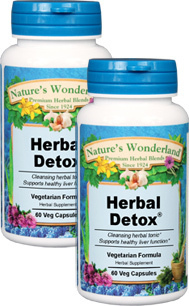 Herbal Detox® - 475 mg, 60 Vcaps™ each (Nature's Wonderland) - Penn Herb Co. Ltd.
Is your body a nutritional landfill, a gathering place for toxins, pollution and unwanted mucus? Get a fresh, clean start with our Herbal Detox®! It purifies the system and restores a healthy, vibrant feeling. BUCKTHORN...promotes regularity and supports healthy bowel function. RED CLOVER…detoxifies the liver and helps clears mucus from lungs. ALFALFA…tonic herb provides vitamins and minerals plus the blood builder & cleanser, Chlorophyll. LICORICE...Traditional Chinese Medicine considers this sweet root an important natural substance that helps neutralize toxins.